Can A £1 Coin Be Worth £10,000? On entering this darkened project space in Bethnal Green, the centre of attention is a £1 coin inside a glass case; is it a particularly special coin? No it's just a normal pound coin, which could be used to buy a packet of crisps or a chocolate bar. So why all the attention? Well, it's part of a rather clever artwork by Jason File. 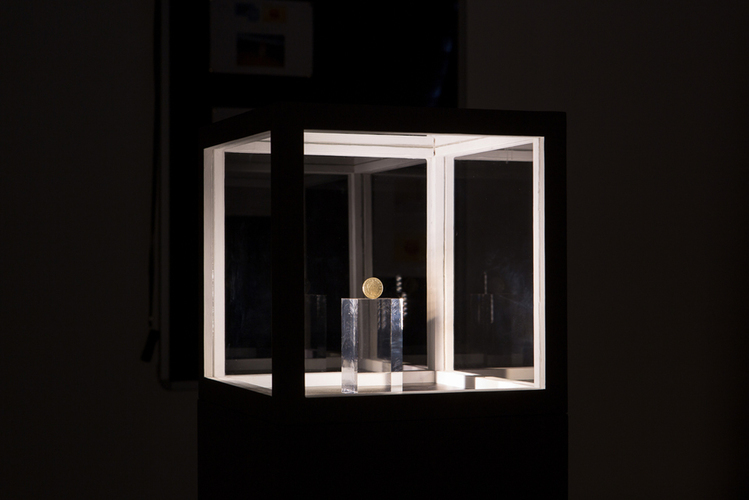 File was awarded a £5,000 grant and he has set out to spend £4,999 of this in marketing and displaying the coin in question — this covers the renting of the space, advertising in art magazines, drinks on opening night and even the artist's travel costs. To make An Ornament and a Safeguard a thoroughly transparent project, all of File's invoices can be found on the gallery walls, with just personal details and special negotiated rates blacked out. With the standard artist's commission of 50%, the coin and its associated evidence can be purchased for £10,000, if a willing buyer can be found. This exhibition has an emperor's new clothes feel to it, and that's the point. The work draws attention to the fact that the process of how value is attributed in art is often arbitrary. In a rational marketplace, supply and demand determines how much people are willing to sell and buy items for. But when dealing with one of a kind artworks, rationality often goes out of the window, the value often driven by a desire to own the piece. The same argument would be applicable to a one of a kind pair of shoes or a supercar. This thought-provoking exhibition stands alongside all those who've ever questioned how an unmade bed or a bunch of spots could be worth so much money. Ironically, on the flipside of the coin, those same people may be angered by File's artwork. Poking fun at the art world while stimulating an intellectual debate on the value of art is what makes this is a brilliant exhibition. Hurry though — there's only a week left to catch it. Jason File: An Ornament and a Safeguard is on at The Ryder, 19a Herald Street, E2 6JT until 6 June. Entrance is free and the gallery is open Wednesday to Sunday, 11-6. For more work that challenges the value of art, visit Made in China at Dulwich Picture Gallery. For more art in general, see our top 10 exhibitions for June.